Escobar and Horchler’s impressive performance was not enough in the loss to JU. Redshirt-Junior David Bell dunked over Junior Noah Horchler to start the game. With less than two minutes into the game, Bell was left open and dunked again. 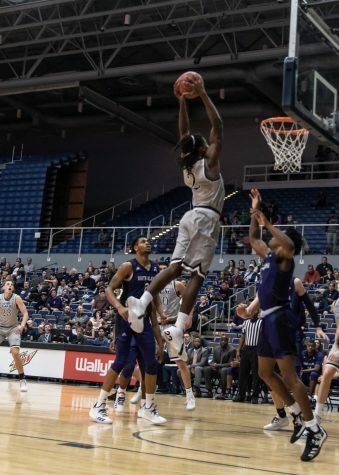 Junior Wajid Aminu tied the game at six on a layup and forced a steal, making a basket close to the rim to put the Ospreys up, 8-6. Aminu continued crashing the boards in the first half, recording five rebounds. Redshirt-Junior J.T. 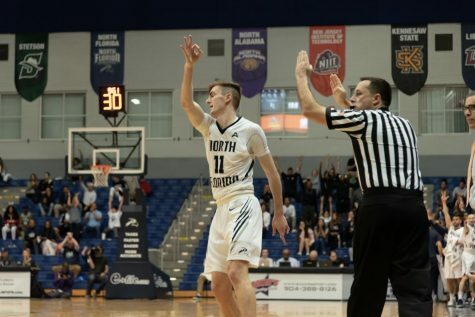 Escobar nailed back-to-back three-pointers for the Ospreys,making it 15-10 UNF. 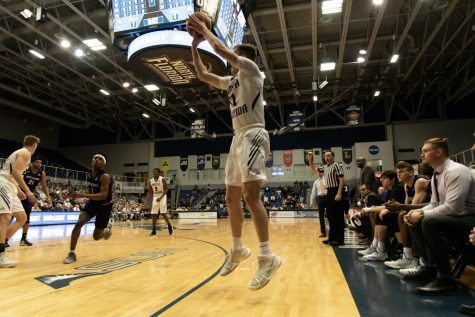 Horchler connected on a long-range shot of his own to put the Ospreys up, 21-15. 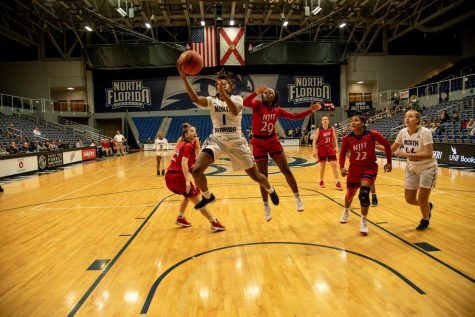 The Dolphins came within two on a two-handed jam by Sophomore Jalyn Hinton, 23-21 UNF. 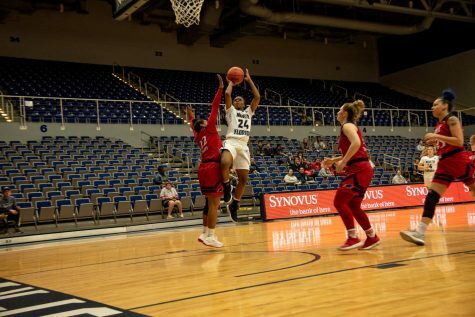 Junior Garrett Sams’ layup pushed the Ospreys to a 32-25 lead. After the second official timeout, the Ospreys led, 34-27. Aminu was the playmaker for the Ospreys’ offense as he recorded 10 points. 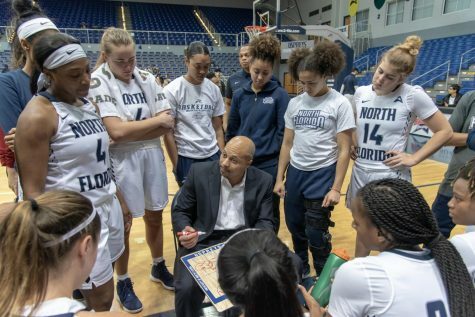 UNF was hot from long-range as they made four of their six attempted three-pointers. The Dolphins began to inch closer in the last three minutes of the first half as they trailed, 36-32. Bell and Sophomore J.D.Notae combined for 16 points. 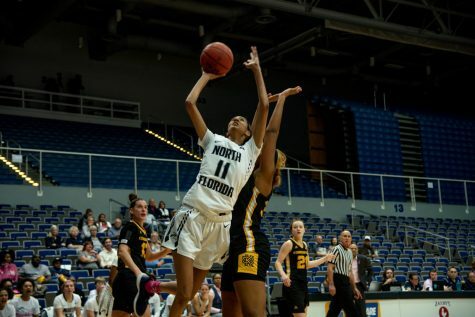 After Notae’s layup tied it at 36, Escobar nailed a three-pointer from the left corner to put the Ospreys up, 39-36. At the end of the half, the Ospreys led, 45-40. Escobar led the squad in scoring in the first half with 13 points (4-6 from deep). The Dolphins were ice cold from beyond the arc, going 1-6. Once again, Bell began the half with a thunderous dunk. Freshman Tyreese Davis tied the game at 35 for the Dolphins on a three-pointer from the left wing. Horchler scored the first points of the half for the Ospreys on a shot close to the rim to put the Ospreys up, 47-45. 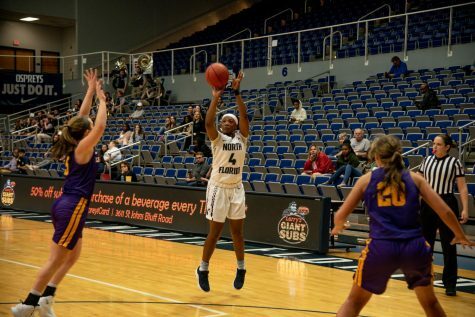 The second half had a speedy pace as both teams countered with big plays that kept the student sections at UNF Arena on their feet. After the second official timeout of the second half, the Ospreys were up, 56-54. At that point, the Ospreys were 1-7 for three-pointers. Junior Tanner Rubio gave the Dolphins a 57-56 lead on a three-pointer from the right corner. Junior Ivan Gandia-Rosa nailed a three-pointer from up top to get the 60-59 lead. JU would keep knocking on the door for the lead but struggled onthe defensive side. After the Dolphins called a timeout with six minutes left in the game, the Ospreys were up, 68-66. Horchler was leading in rebounds with nine for the squad. Bell’s dunk (his fifth of the game) put the Dolphins up, 70-68 until Aminu brought down an alley-oop with authority to tie the game at 70. The Ospreys continued to miss the mark on their shots as the Dolphins penetrated the post. 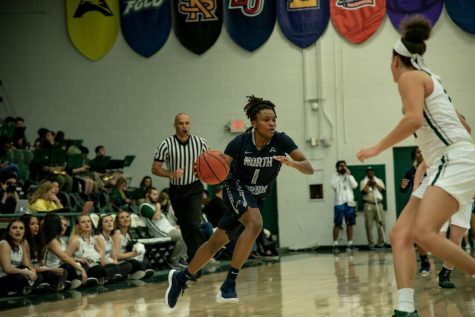 After making six straight points, the Dolphins began to separate themselves from the Ospreys as they led, 76-70. With 1:30 left in the second half, Escobar hit a short-range jumper and got a foul shot opportunity which shortened the lead to 78-73. Horchler found a good look inside as the Dolphins were called for goaltending which granted Horchler the two points to make it, 79-75 JU. 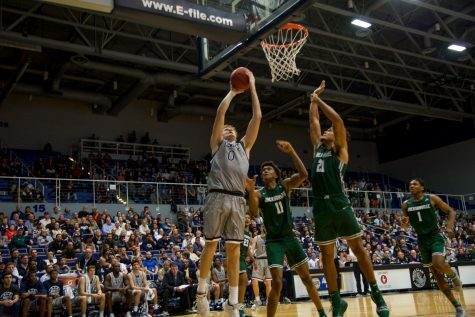 With 30 seconds left on the clock, Freshman Carter Hendricksen drilled a three-pointer from up to put the Ospreys within five, 82-78 Dolphins. Escobar followed with a three-pointer to get within three of the Dolphins, 84-81. It was too late as the Dolphins won, 86-81. Escobar and Horchler finished the game with 23 points apiece. Gandia-Rosa led the team in assists with seven. 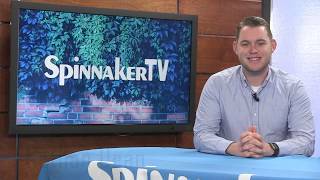 Coach Matthew Driscoll talked to the Spinnaker about the team’s drop off of three-point shooting in the second half. “I think our three-point shooters did not make three point shots. Going back, looking at it in my brain, I’m not sure we took a lot of tough shots and I thought we had some looks,” Driscoll said. Escobar talked about the intensity of the River City Rumble matchup and how it’s different from the other ASUN opponents. “It’s a big game obviously, and it was a big showout tonight with the fans. 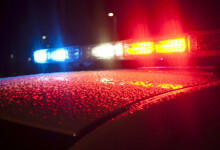 It was especially big for a league game,” Escobar said. The loss drops the Ospreys to 9-13 (3-4 ASUN) and the win pushes JU to 9-12 (2-4 ASUN). 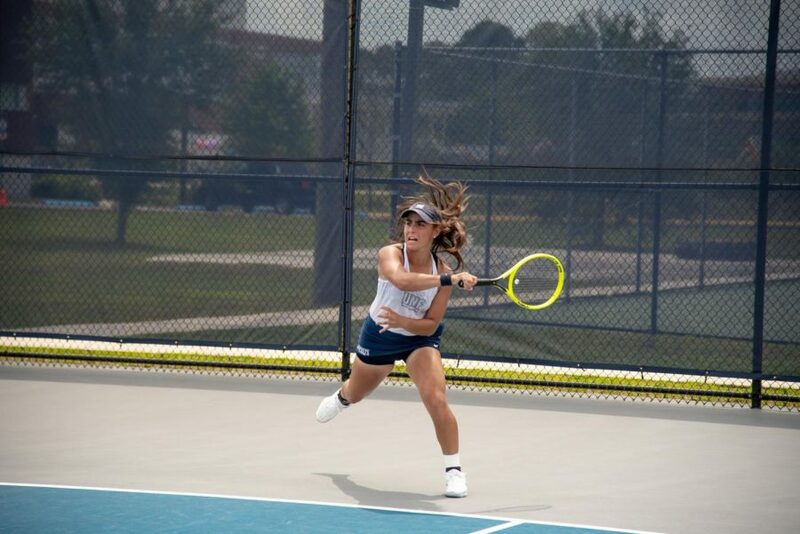 The Ospreys head to Fort Myers to take on FGCU on Sunday, Jan. 27 at 5 p.m.